The school has been performing steadily well during its establishments. 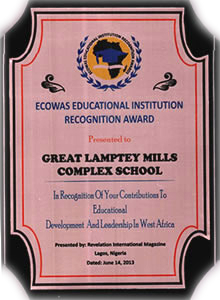 Great Lamptey-Mills Institute has won several awards from the early Middle School Certificate Examination through to the Common Entrance Examination to the Basic Education Certificate Examination. (B.E.C.E.). Also the school has won many awards through various sporting activities.